Entlebucher Mountain Dog is the smallest of the four Swiss mountain dogs. The naturally bobtailed Entlebucher is believed to have descended from cattle dogs brought by the Romans to Helvetia 2,000 years ago. The breed takes its name from Entlebuch in the canton of Lucerne. Also known as the Entlebucher Sennenhund, which means “dog of the Alpine herdsman,” the breed was used to drive cattle to market. 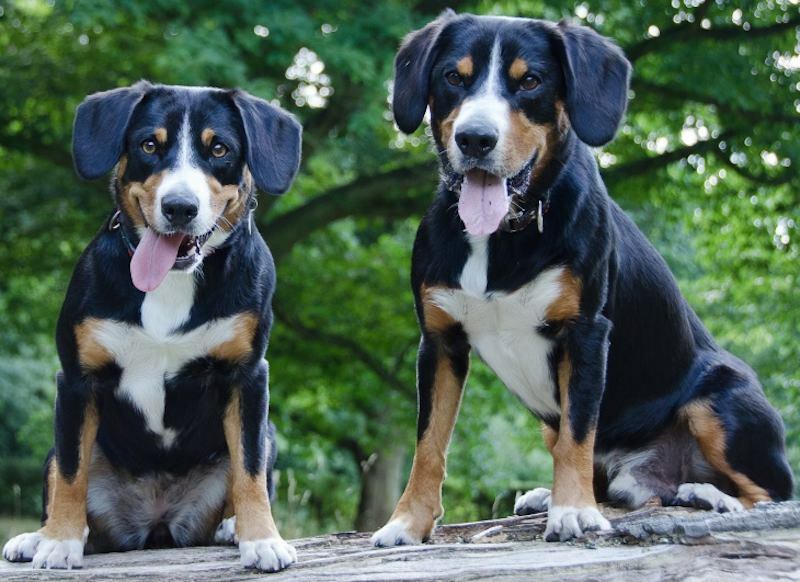 Entlebucher Mountain Dog Temperament: The breed is quiet and easygoing. Though independent and self-confident, they are very tuned to their owners. Entlebuchers are very aware of boundaries and are territorial and protective, but not aggressive. They delight in the company of people and are friendly with other dogs. General Appearance: Entlebucher Mountain Dog is smaller than an average sized dog, well proportioned in every way. Very mobile and nimble with a friendly and intelligent look. A good guardian and herder of cattle; a faithful and incorruptible guard dog and companion. Size: Height 40-50 cm at the shoulder. Head: Well-proportioned to the rest of the body. Flattened forehead with a slight stop. The jaw is powerful and well shaped. The muzzle clearly detaches itself from the forehead and from the cheeks. Cheeks are not very well developed. The eyes are rather small, brown, alert. The nose is black. The ears are of medium size and set high. The ear is rounded at the bottom, pendulous and set close to the head. As with all Swiss mountain dogs, the ear is turned slightly towards the front when the dog is alert. Neck: Short and compact, connected to the body without transition. Body: Fairly stretched out, giving the dog the general appearance of being longer than he is tall. The chest is deep and broad. The back is straight and strong. Legs: The shoulder is long and oblique. The legs are straight and sturdy; hocks at right angles. Feet round and tight. Dewclaws are undesirable. Tail: The tail is blunt from birth. 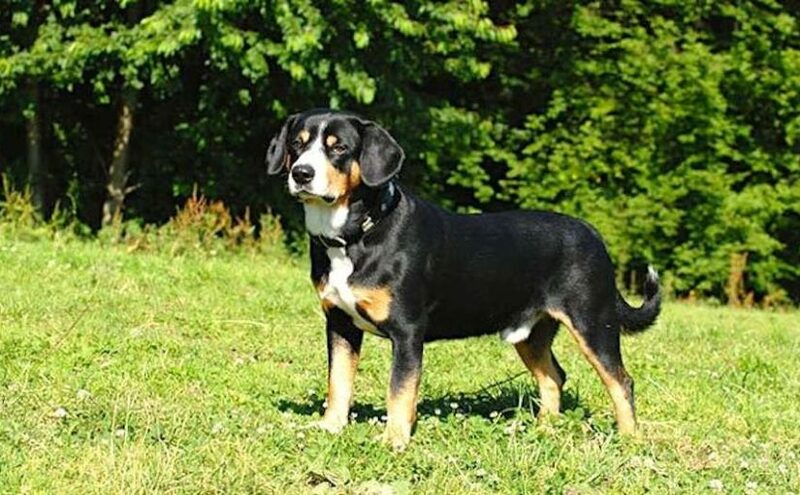 Coat: The coat is similar to that of all Swiss mountain dogs: black with markings varying from yellow to rusty brown over the eyes, on cheeks and on all four feet. Symmetrical white markings on the head (blaze), on the neck, on the chest and on the feet are also viewed positively; yellow or brown colouring must then be situated between the black and the white areas. Particular faults: A rounded superior part of the head, light coloured eyes; an elongated, fine or curved muzzle; a muzzle that is overshot or undershot. Pointed, short, detached or poorly set ears. Splayed toes. Inappropriate colours or too much white colour. Hair too long or too soft.